The wholesale drug distribution industry is regulated by both federal and state laws. Every state in the country requires wholesale drug distributors to obtain the proper licenses before they can legally operate within state borders. The type of licenses required in each state can vary based on physical location, and the types of drugs being distributed. For example, California requires out of state distributors conducting business within the state to file a different application than an in-state distributor. Further, a distributor may also be required to register with the DEA, as well as state and local drug enforcement authorities if they are distributing federally classified controlled substances. In addition to general license requirements, many states now require accreditation from the National Association of Boards of Pharmacy, known as a VAWD certificate. Both federal and state governments have an interest in regulating the distribution of drugs due to the dangers associated with counterfeit drugs, distribution of outdated or expired drugs, and to limit fraudulent or corrupt activity on the part of wholesale distributors. Most state licenses are obtained through the state’s Board of Pharmacy. Many states reserve the right to deny a license based on public interest or general welfare. 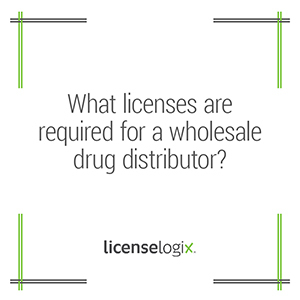 Generally, a company must first obtain a wholesale drug distributor license in their “resident” state. This can require submission of an extensive application, application fees, copies of internal policies and procedures, and surety bonds. Some states require background checks and fingerprinting as well. Once a resident license is obtained, the business may obtain a “non-resident” license in each additional state they wish to operate in. A wholesale distributor operating without a license, or with an expired license, may be subject to fines, imprisonment, or other civil penalties as seen fit. LicenseLogix will research the specific licensing requirements in all jurisdictions your business will be operating. Your Account Manager will prepare and submit all paperwork on your behalf and handle any issues along the way. Once all licenses have been obtained, we will ensure that your business stays in compliance by tracking license status and preparing all renewal applications. Let our experts help! Live Chat with an expert now, or give us a call at 1-800-292-0909.